"How to Beat 75% of All Tennis Players by Hitting Lightly"
One of the first things I teach my students is to be consistent. Consistency is what I call the primary rule. I'd estimate you can beat 50% of all the tennis players in the world by simply getting the ball in play over and over again. You don't even have to hit the ball very hard. If you make virtually no unforced errors it puts a tremendous amount of pressure on your opponent. If you can keep the ball relatively deep for most of the shots it makes for very long points. Eventually your opponent will get desperate and end up making an unforced error. In teaching my students I'm amazed at how many of them I can beat by simply getting the ball back in play repeatedly. Even advanced students who have topspin and fairly good aim still have problems when I play what I call Level 1 and really run down their shots. They eventually crack under the pressure. Whenever you are losing a match, you should consider reverting to this ultra safe strategy. Just get the ball in back in the middle of the court and don't worry about hitting winners. You only hit a winner when it becomes an easy shot for you that you are sure you won't miss. Otherwise you let your opponent be the aggressor. To learn how to beat 75% of all tennis players in the world then please continue reading the article at this link. The next level of proficiency is called Level 2. At Level 2, I hit at most, 70% of my power. In fact, sometimes I hit very lightly. This level is the accuracy level. I've found it's much easier to be precisely accurate when you hit lightly. You can also make your opponent run like crazy. You don't go for really difficult shots. If you keep your errors down, you'll find that you can easily beat 75% of all tennis players out there, by doing this strategy. It doesn't require hitting any topspin or hard strokes. Nevertheless, it does work best if you understand strategy and court positioning. The idea is to use angles and the whole court. Ninety nine percent of all players are too busy trying to hit hard to take advantage of using the whole court. They only focus on hitting deep shots. But that is only a small part of the court. By hitting lightly you can use the whole court and make your opponent run. You need to be able to hit lightly to hit the best angled and drop shots. You can make your opponent run more by hitting lightly. The reason for this is that I've found that players can be much more accurate when hitting lightly. Try aiming for the side T's of the service box. The idea is to drive your opponent way off the tennis court. Then when you did that, you hit a deep shot to the other corner. Next, you hit a drop shot in the other corner; if your opponent manages to reach that shot, you can hit an easy lob over their head to win the point. The key here is that you never had to hit a very risky shot to win the point. This is low risk and low stress tennis for you and high stress for your opponent. You'll have your opponent running like crazy. He/she will go for risky shots to try to end the point quickly. These strategies work very well against players up to a 4.5 skill level. As the players get better you will get to a point where hitting light and well placed shots will not be enough. You'll also have to use power on occasion. But even advanced players use light shots and deception. Knowing when to hit these shots and how to disguise your shots is an important part of all of this. If you'd like to learn these and other strategies in detail, you can sign up for indoor or outdoor tennis lessons with me. The weather is starting to get good so I am starting outdoor lessons again. My regular rate for private lessons is $40 per hour. For the rest of March 2004, you can book outdoor private lessons with me in the East Brunswick area for only $33 per hour. This is my incentive to get you outdoors and to help you take your tennis game to the next level. 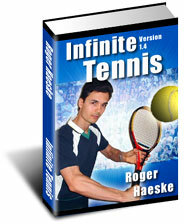 For more information on my tennis lessons, visit http://www.supertennis.net/TennisLssns.htm or email me at roger(at)supertennis.net. Get Andre Agassi's new string Luxilon Big Banger ALU Power, 16L guage. This string is one of the hottest on the market. It provides great control and tremendous durability. Big Banger is the most wanted string among professional players! Not less than 55 % of all ATP-top 100 ranked players confide in Big Banger (December 2003). Here's a little more about the string. This new string is constructively a complex string as extra aluminum fibers had to be added in a separate compounding process to give this string extra tenacity. Advantages: Higher tenacity despite its fineness. Superb control due to thin gauge. High elasticity. Reduced tension loss. Ideal performance at lower tensions (more power). Practical tests showed: this string has more power than any string. Loss of tension is almost nil, so the string's characteristics remain even after a long time. The regular price for this string is $35. You can get it for $29 while my current supply lasts. Call me at 732-432-4839 to arrange to have your racquet strung. Or drop your racquet off at Rte 18 Sports in East Brunswick. That way you can easily pick it up whenever they are open.